Later, after opening the trade it turned against me. I wasn’t panicking and continued sitting tight to see the outcome. Will the stock recover or will it continue down and endanger my strike price? 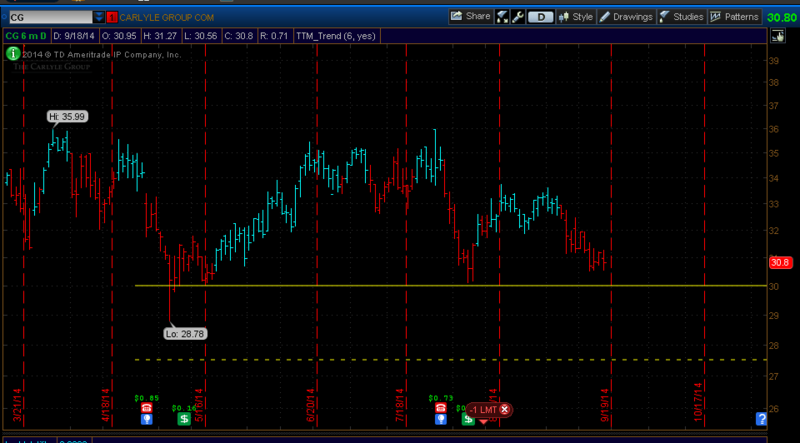 The stock price continued getting closer to the support level and my strike price. The stock may reverse, bump off of the support line, but thanks to the nervousness in the stock market, where investors expect the Fed raising interest rates, all income producing assets continued to be on sale. The stock may also breach my strike, fall below it, and I may have troubles to manage the trade. Roll the trade down to the next lower strike, but the same month – December. This would create a cushion for our trade but it will increase our margin requirements by circa $370 because we will have to sell more new contracts. Roll the trade down and further away in time into March 2015. This will also create a cushion to our trade, but increase time we have to wait for this trade to end. On the other hand, this option will not increase our margin requirements. We will also sell more new contracts to keep the trade a credit one. You like the stock and want to own it. At this case you may decide sitting tight and let it exercise in December. In that case you will own 100 shares of CG at $30 minus received premium. I chose option #3 to roll down and further away in time. This trade adjustment lowered my strike price below the current support line which should give me a plenty of room to overcome and sustain the general stocks selloff of the dividend stocks. If the stock doesn’t breach the $30 support, bounces, and continues up, I may expect the option losing value faster and be able to close the trade earlier than in March 2015. See the chart below for the existing strike (and support) as a solid line at $30 a share, and a new strike as a dashed line at $27.5 a share. And again, if the trade continues going against me, I will roll it down and further away in time. If the trade expires worthless, I will keep the entire premium (the original one and the new one).